Daily Illuminator: Nostalgia? You Betcha! April 4, 2011: Nostalgia? You Betcha! September/October of 1983 was a busy time for Steve Jackson Games. Ogre and Car Wars were selling well, and SJ's interest in designing GURPS was just beginning. On top of all this, the company planned on attending both Gateway and WorldCon . . . on the same weekend! Even with all this, the staff managed to get Space Gamer #65 off to the printer. 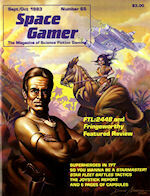 This issue is pretty review heavy: FTL:2448 and Fringeworthy from Tri-Tac Games, Revised Champions, and a new (for 1983) computer accessory called "the joystick." Another six pages of smaller reviews were tucked away in the back, covering games, miniatures, and even gameable movies. I didn't know Molly Ringwald was in SPACEHUNTER: Adventures in the Forbidden Zone! Of course, this issue wasn't all "what we thought about that." An article on tactics in Star Fleet Battles and another using The Fantasy Trip mechanics for a super heroes game are front and center of the table of contents. And the columns by Aaron Allston and SJ provide a bit of "behind the curtains" flair. For $2.99, where else could you find insights like these? Oh, I nearly forgot! 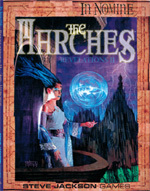 e23 also uploaded In Nomine: The Marches, a sourcebook on the dreamscape between Heaven and Hell. No, wait -- it's an adventure: Book Two of the Revelations Cycle. But there's a bunch of information on Archangels Blandine and Gabriel, the Demon Prince Belial, and the Demon Princess Beleth, too. Is that a campaign setting and two new Choirs as well? All that plus rules for mortal Sorcerers fit into 131 neatly packed pages? In Nomine fans, you must have this one. (And for a limited time, you can pick up a physical copy as well from Warehouse 23).